Oct 18, 2016 – A delegation from Sweden’s Karolinska Institute led by Professor Maria Masucci, vice president of international affairs, visited Beike Biotechnology’s headquarters and the International Stem Cell Base adjacent to the main venue of the “2016 National Mass Innovation and Entrepreneurship Week” to explore medical research cooperation activities. Dr. Hu Xiang (Sean Hu), chairman of Beike Biotechnology, warmly received the delegation. During the visit, the Karolinska Institute delegation listened carefully to Dr. Hu’s introduction of the development, core technologies, and achievements of Beike Biotechnology and exchanged views on topics such as the development of regenerative medicine and the clinical application of cell therapy technology. Maria Masucci said that Beike Biotechnology has contributed much research in the field of life sciences, keeping pace with the world, and insome areas are even in a leading position. The Karolinska Institute focuses on regenerative medicine, cancer research, microbial medical research and other areas. She hopes both sides can further strengthen exchanges in basic research on stem cell technologies and seek more cooperation in order to address the threats to human health and explore answers to the key issues. Shenzhen is a city of innovation in China. In recent years, a number of industry-leading enterprises such as Beike Biotechnology have been focusing on innovative technologies to jointly build a solid base for the life and health industry of Shenzhen. Relying on scientific and technological innovation, Beike Biotechnology has gradually developed into the poster child of Shenzhen’s booming healthcare and life sciences industry. Beike Biotechnology is a microcosm showing that Shenzhen can enhance the capacity of independent innovation in this field. 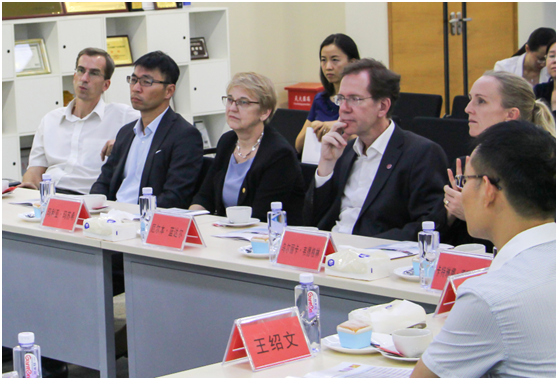 The delegation of the Karolinska Institute deeply felt the strength and pace of development of Shenzhen enterprises and have a new understanding of the local biotech development. They believed that Beike Biotechnology is a truly innovative enterprise with scientific research strength. Karolinska Institute was established in 1810 as the largest medical university in Europe as well as the top single medical school in the world. The Institute is known as the “cradle of the Nobel Prize in medicine” due to their international-leading level of scientific research and evaluation being awarded the Nobel Prize in Physiology and Medicine. Its disciplinary development strategies focus on clinical epidemiology, tissue biology, medical genetics, biochemistry, stem cell biology, cell biology, apoptosis, cell differentiation regulation, cell therapy and so on.